I bet you that you didn't have the same first thought as me upon hearing the name of the new expansion, because for me it was: "Onslaught, huh? That's going to take some getting used to." 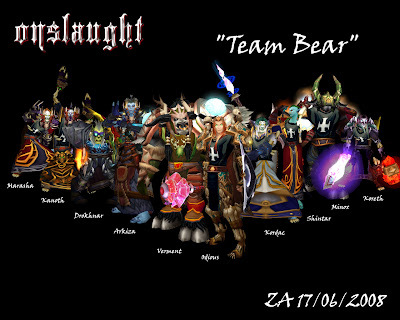 The reason for this is that my World of Warcraft guild of five years was called Onslaught, so that's a pretty deep-set primary association with the name that I'll have to change. It's also a break with the previous naming scheme for SWTOR's story expansions, which was more or less "Subject of the object". The announcement didn't include a big CGI trailer - in fact there was no trailer at all, but I assume that at least a basic one is still to come. Either way, substance is more important than style in this case, and there was plenty of the former! We got confirmation that we'll be getting pretty much all the big ticket items that people have been asking for in recent months, so yay us! I'm sure more details will be revealed as time goes on but let's have a quick look at the major bullet points and I'll add my initial thoughts on them as they stand. Mek-Sha isn't technically a planet in astronomical terms (it's an asteroid) but we're talking about these in terms of gameplay features here and they'll both be big new locations. Eric and Charles said relatively little about the storyline other than that it's going to continue the Republic vs. Empire thread that we started on Ossus, which makes sense as they usually like to keep the details of these a secret so that they can be a surprise later and to be honest that's how I as a player like it too. The splash art seems to indicate that a big showdown between Tau and Malgus is coming up though. Onderon seems to have many people excited due to being a planet from KOTOR 2, but since I still haven't played that because they still haven't released a mobile port, it means little to me. (Apparently it also appeared in the Clone Wars, where I still haven't made it past season two.) The only association I had with the name was that C2-D4 repeatedly said that he used to serve the queen of Onderon, so I wonder if that means that he and Jakarro will make a return? Charles Boyd actually asked during the Cantina event whether people would like it if Jakarro was on Onderon, but it was unclear whether that was a hint or him still trying to decide whether to include the Wookiee as a side character or not. 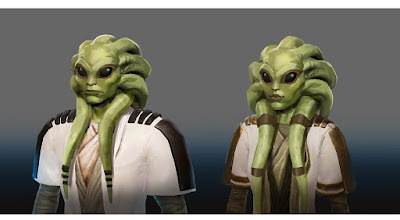 Concept-wise, nothing they said about Onderon or Mek-Sha sounded drastically new and different - Onderon is a place of noble houses so we might get some story vibes similar to Alderaan, while Mek-Sha sounded like another potential haven for smugglers and other shady characters. Mind you, at this point I guess it's hard to come up with a concept for a planet that isn't similar to anything they've done before... I'm sure the devil (aka most interesting stuff) will be in the details. Going back to Corellia also sounds good to me, because I think it's nice to mix things up by returning to older planets every now and then. I guess I would have preferred it if the main storyline hadn't been tied directly into the new flashpoint, but that seems to be the strategy they are rolling with right now. Oh well. 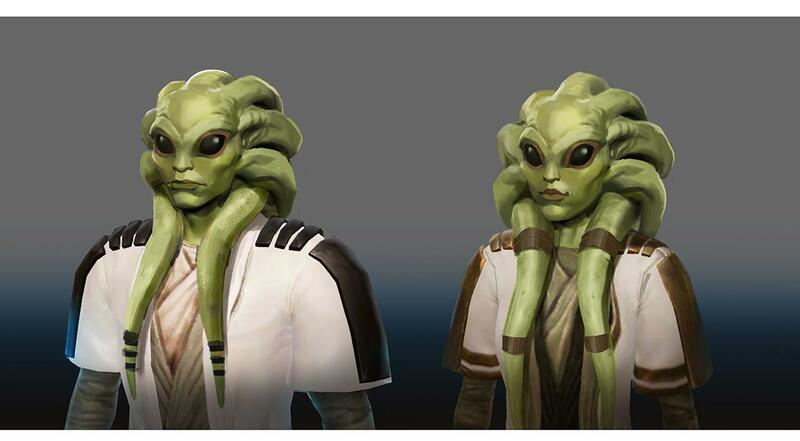 Dxun is one of Onderon's moons and another KOTOR 2 reference. But hey, new operation, yay! Really glad they took the time to a) actually build another operation and b) do so in full this time after the so-so results of releasing Gods from the Machine piecemeal over the course of an entire year. I don't think it's been stated how many difficulties the new operation will come with - I assume two are a given, but is a third one at least planned, even if it might not be live at launch? No more hardmares please. In case the last two years made you think that Bioware tired of level cap increases, we got confirmation that Onslaught will add another five levels to the game to mix things up again. Plus every class will get at least one new ability! Part of me is like "yes but how many more abilities do we really need", while the other, louder part is like: "I don't care, gimme!" I don't think they've ever added any new abilities to the game that I didn't like; at worst it sometimes took me a little while to figure out what made a new ability good and when / how to use it to the greatest effect. The only thing to watch out for is whether they'll decide to prune any old/existing abilities to balance the scales (which they have done before). I was kind of surprised by the way this seemed to be the single most cheered for announcement at the Cantina, based on the video I watched. Not that it's not a nice thing; I'm just not sure it's nicer than everything else. I'm not sure how much use I'll make of this new unlock myself - I do think Nautolans are very cool and I would definitely like to have one, but I also suffer from a certain degree of what you could call alt fatigue at this point, due to already having too many alts that I rarely ever play and feeling like I'm "neglecting" them and that I really shouldn't add any more to the mix (yes, I know that's not rational; that doesn't change the way I feel though). This one was probably the biggest head-scratcher about the announcement as it was about system changes and slightly vague ones at that, which kind of makes you go: "I guess that sounds good, but I'd have to see it to be able to say how much I like it". The main thing I was hoping for was simplification of the current gearing system, even if I know that something like that wouldn't be very exciting to announce. Not to mention that even if they are planning to do it, they might not have worked out enough details yet to talk about how it will work. Anyway, that didn't happen - in fact the only thing even vaguely going in that direction was some talk about simplifying the process of moving gear across your legacy, which I have mixed feelings about because personally I've actually avoided doing too much of that anyway as I prefer all my characters to have their own gear sets. However, I guess if this change cuts down on certain guild members (you know who you are) constantly having to log through their entire stable of alts before every operation just to find where they left their trousers this time, I'm all for that. The bigger issue though was that they talked about wanting to change the way we pursue gear in general, by giving us more different set bonuses to choose from, some of them cross-class and not even combat related. There is also going to be an entirely new gear slot that's meant to allow you to customise your most-used abilities. Eric Musco's made-up example was having a Sorcerer's chain lightning hit more targets vs. turning it into a punchier single target attack. I was instantly reminded of WoW's glyph system ca. Wrath of the Lich King/Cataclysm, which then led to me trying to remember why that didn't really work out, but I couldn't. I don't recall it being an utter disaster, so I guess it's fair enough for Bioware to give their own version a try. There are two major sticking points that I see, with the first one being balance. 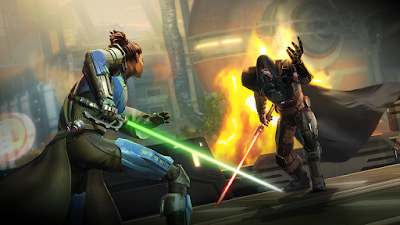 SWTOR's player community isn't as obsessed with min-maxing as e.g. World of Warcraft's, so I'm sure there'll be more room for people to play around with different options without being shunned, but it does give the devs more things to worry about when it comes to balancing both PvP and PvE encounters. The other concern I have can simply be summed up with the words "too much gear". One thing I've really liked about 5.0 was that they did away with separate sets of PvE and PvP gear. However, with all those new set bonuses and new game-changing items we'll suddenly have a lot more to think about than simply those two game modes, because who'll want to stick to just a single set at all times? Just how much of my bag space is going to be taken up by having to lug new alternate gear sets around? Also, and this may sound weird, but on a gut level I'm not sure features that are supposed to heavily customise the way we play should simply be stuck on gear. Shouldn't these things be a bit more inherent to our characters, like our combat specialisations and utilities? These were just the sort of thoughts that immediately came to my mind. All of this is supposed to come in September, so currently about five months away. I've seen a lot of people say that this is actually less of a wait than they expected, but I don't know why anyone would have expected Bioware to announce this kind of thing much further in advance. Looking back at previous story expansions, they usually announced them around four months before their release. Shadow of Revan even had only a mere two months between its reveal and launch! Which is not me saying that I think five months is short or long, just that it's pretty in line with how they've handled these things previously. I'm looking forward to learning more about Bioware's plans for this expansion. The Tactical Item reminded me of Wow's Legion legendary items. Those could change how abilities and your rotation worked. They could really make your abilities a blast to play. The downside was the ugly side of RNG in obtaining them. If you weren't lucky you didn't get anything good until Blizzard added a way to target specific ones via game currency (several patches in). Depending on how plentiful the Tactical items are will be interesting to see. Also, will we be able to remove them as we do with mods, enhancements, etc., or will they be a put in a new one and destroy the one already there? We'll see. I suspect the system will be a bit like Galactic Command where it is rough in the beginning and smooths out over time as BW sees how people are actually using them. Going back to Onderon made me smile. I like Kotor 2 over Kotor 1 for the story so it was cool to see them revisiting it. I played the original, very buggy version, pre-Restored Content Mod. Now I need to replay Kotor 2 to refresh myself about those areas. I think they said that Corellia would have a new area tied to the flashpoint, but I could be mistaken. Maybe it will be like Manaan in that regard. Still, going back the the Classic worlds is cool. Interesting point about the rarity of Tactical items. I wouldn't expect them to be legendary-rare, since that would kind of go against the way they talked about wanting this new system to allow us to play our characters however we want to. I would also expect them to work like other gear in that you can simply swap them in and out. But you're right that they haven't specified that. My first thought regarding gear sets was it sounded a lot like the ESO system. ESO haven't had a level increase for years now and use new sets as an incentive to do new content. If they do it similar to ESO then they can make all types of content relevant for gearing. Different content types could drop different sets, so PVP related sets drop from PVP, generic dps/heal/tank sets from FPs, class specific sets drop from OPs. GC drops all sets, and Crafting does niche sets. As much as I love Ossus, that being the only real way to gear is lame, multiple sets from multiple sources would be cool. This is all speculation but if done right it will extend the play time of the game. A casual player can focus on one set and be viable and a min/maxer can go chase several sets to get a perfect combo. I do fear that the combat team will struggle with the complexity that the system brings and balance is going to be so broken early on. Hopefully they'll release details for discussion well ahead of time so that it tweaked before release. Last thing I want is them to do another GC where they release something so broken they have to spend six months of dev time fixing it rather than doing new stuff. You know, the ESO connection occurred to me too after I thought about it some more, but as someone who's not been playing ESO for that long yet I don't quite know what to make of it. My own main impression of the system in ESO so far has been that the amount of gear sets is absolutely overwhelming to a casual player. I've found some helpful sites that allow you to filter them by stats and such, but I still don't know how a new player is supposed to get even a rough idea of what might be good for them when it comes to the set-specific abilities/buffs. I might find something similar in SWTOR more engaging since I've got a much better idea of what's going on there, but it certainly would be a recipe for having storage issues. Of course, what I've long since (futilely) been holding out for is for class storylines to return.